TIMESTAMP 08/11/2009. 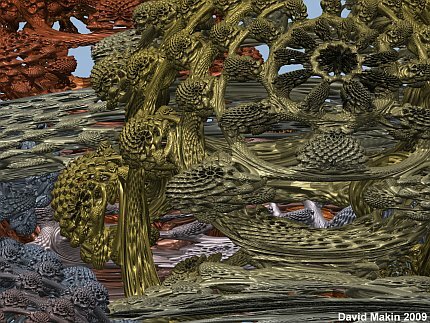 The original Mandelbrot is an amazing object that has captured the public's imagination for 30 years with its cascading patterns and hypnotically colourful detail. 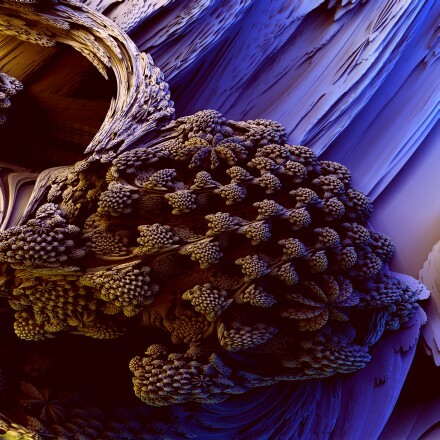 It's known as a 'fractal' - a type of shape that yields (sometimes elaborate) detail forever, no matter how far you 'zoom' into it (think of the trunk of a tree sprouting branches, which in turn split off into smaller branches, which themselves yield twigs etc.). It's found by following a relatively simple math formula. But in the end, it's still only 2D and flat - there's no depth, shadows, perspective, or light sourcing. 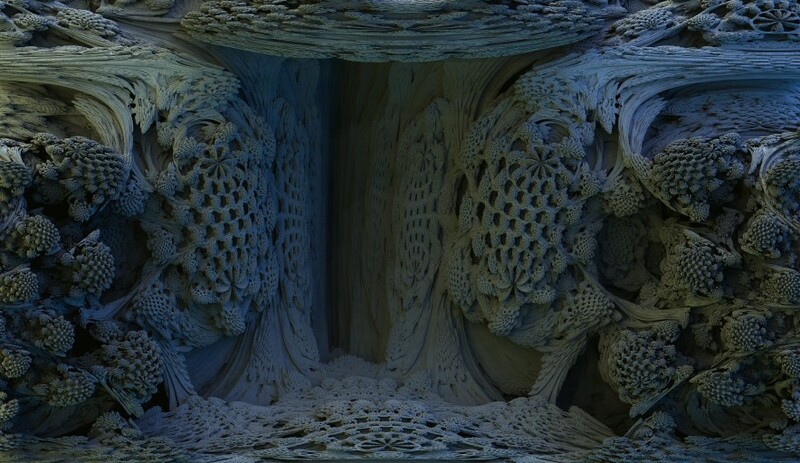 What we have featured in this article is a potential 3D version of the same fractal. For the impatient, you can skip to the nice pics, but the below makes an interesting read (with a little math as well for the curious). 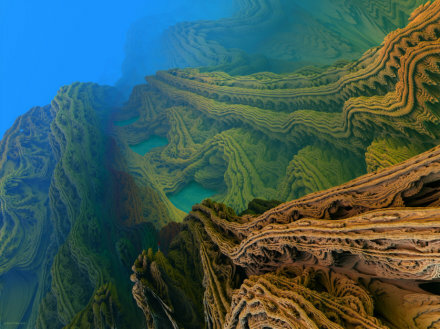 UPDATE 19/12/2011: New Skytopia Mandelbulb gallery found here!. Is this merely a fool's quest? 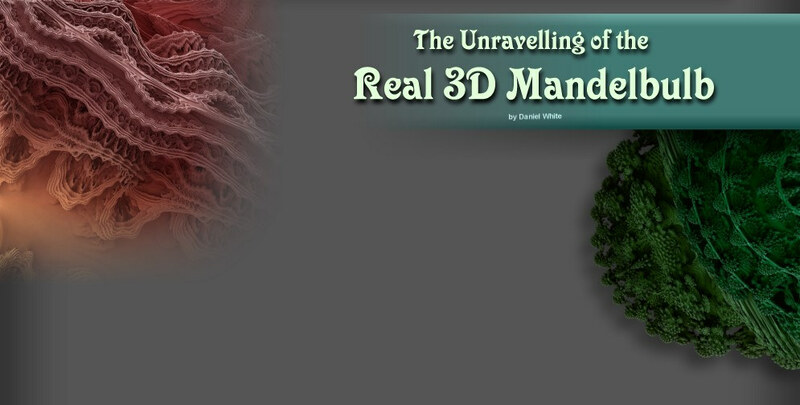 Page 2: Epilogue: Is this... the real 3D Mandelbrot then? 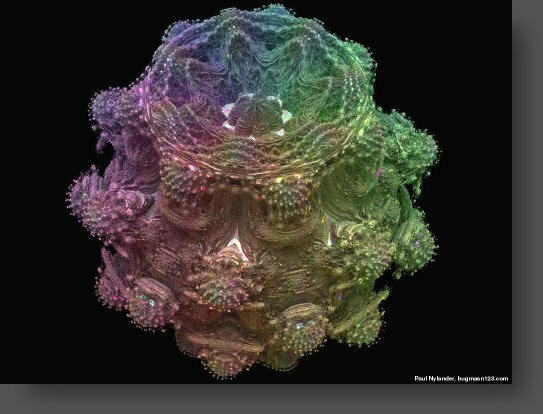 It's been almost two years since we last wrote about the potential for a real 3D equivalent to the famous 2D Mandelbrot set. 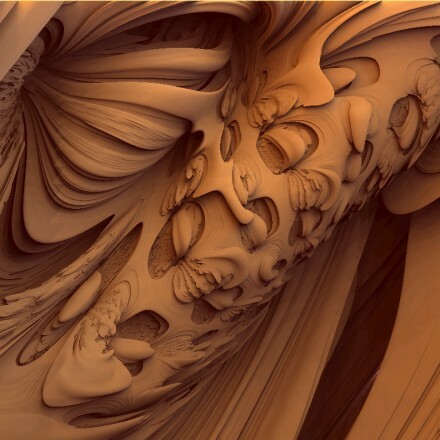 We're talking about a fractal which produces exquisite detail on all axes and zoom levels; one that doesn't simply produce the 'extruded' look of the various height-mapped images, or the 'whipped cream' swirls of the Quaternion approach. 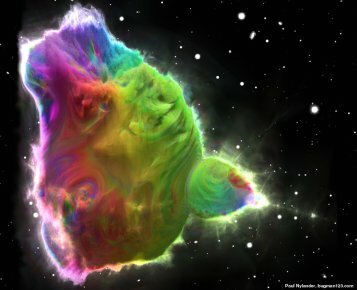 The article received a degree of popularity, but in the end, the problem remained open, and the Mandelbrot refused to relinquish its deepest secret. 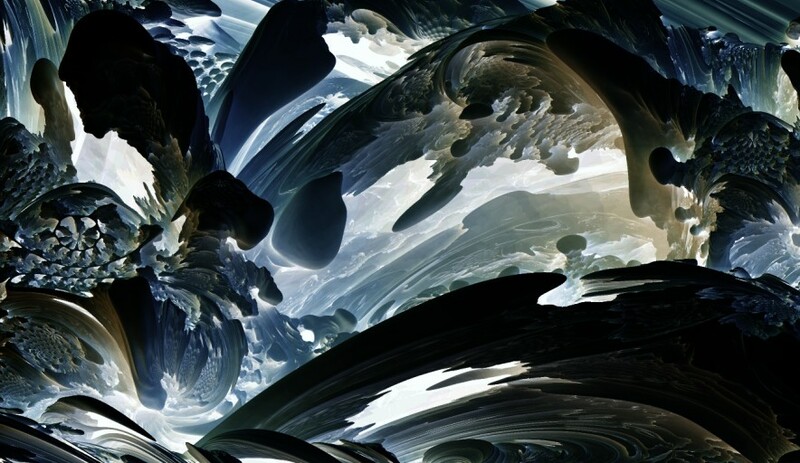 At times, it felt tempting to give up the search, but the potential for the thing is too great - we are talking about the Holy Grail of fractals after all. ur story starts with a guy named Rudy Rucker, an American mathematician, computer scientist and science fiction author (and in fact one of the founders of the cyberpunk science-fiction movement). 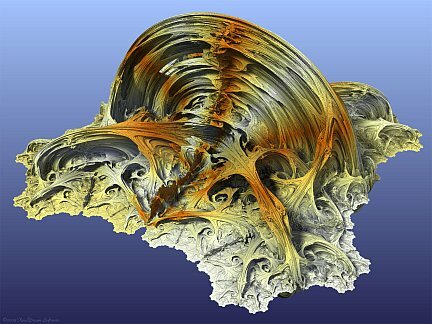 Around 20 years ago, along with other approaches, he first imagined the concept behind the potential 3D Mandelbulb (barring a small mistake in the formula, which nevertheless still can produce very interesting results - see later), and also wrote a short story about the 3D Mandelbrot in 1987 entitled "As Above, So Below" (also see his blog entry and notebook). 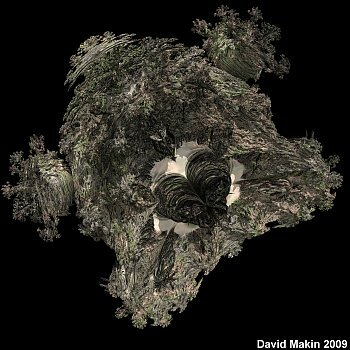 Back then of course, the hardware was barely up to the task of rendering the 2D Mandelbrot, let alone the 3D version - which would require billions of calculations to see the results, making research in the area a painstaking process to say the least. 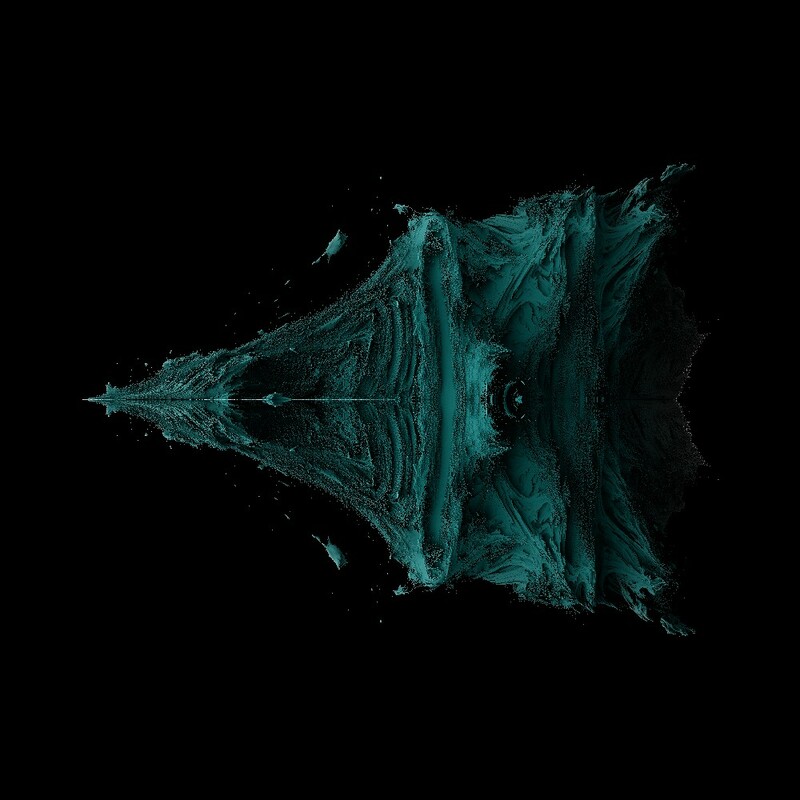 The first thing I tried was multiplying phi and theta by two, resulting in the shape you see above. 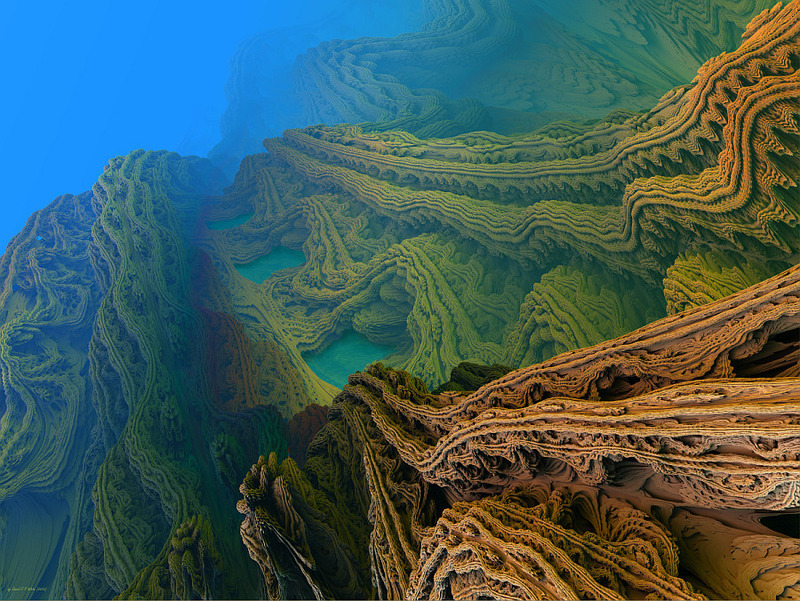 It's nice, but not exactly what I'd call a 3D Mandelbrot (zooming in doesn't show true 3D fractal detail). 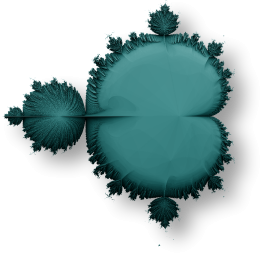 This one is the same as to the left, except offsets have been added to the multiplication bit (0.5*pi to theta and 1*pi to phi), to make it appear almost 3D Mandelbrot-esque. Also see Thomas Ludwig's globally illuminated render, and this one from Krzysztof Marczak. Same as the first, except this time we try only multiplying angle phi by two, but not theta. 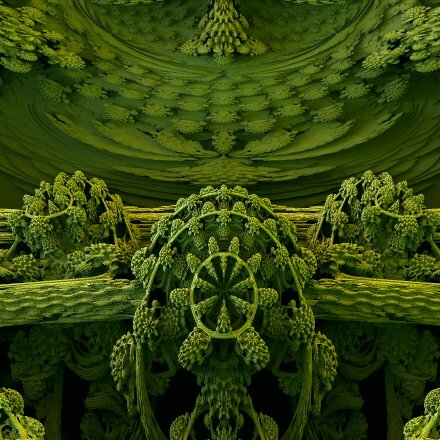 Although the second one looks somewhat impressive, and has the appearance of a 3D Mandelbulb very roughly, we would expect the real deal to have a level of detail far exceeding it. 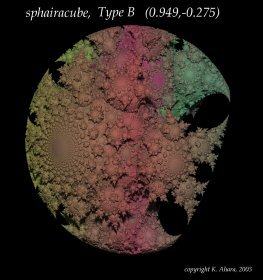 Perhaps we should expect an 'apple core' shape with spheres surrounding the perimeter, and further spheres surrounding those, similar to the way that circles surround circles in the 2D Mandelbrot. 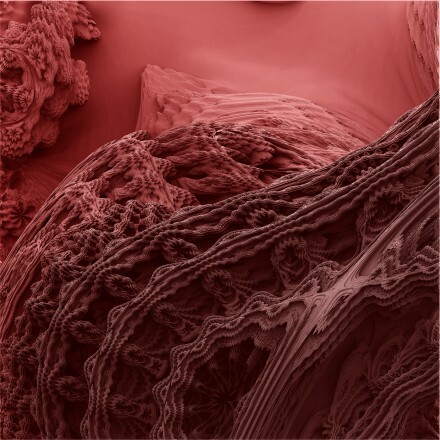 A glimpse of this detail can be traced back to as early as November 20, 2007, with this preliminary cross-section render created by Thomas Ludwig - the first person to render and witness the (Power 2) Mandelbulb in 3D (other than my early crude height map images like this one). The red box in that linked picture is the area in the large picture shown above if you zoomed in! Full size shown here. For other 'hot spots', try here, and this one from the inside. Created by Dr. Kazushi Ahara and Dr. Yoshiaki. 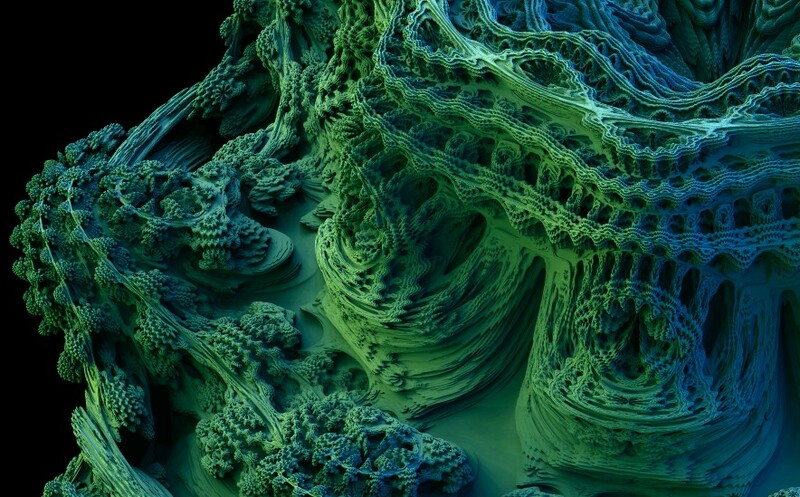 This looks great, but zooming in will not reveal the variety of style that the Mandelbrot has. 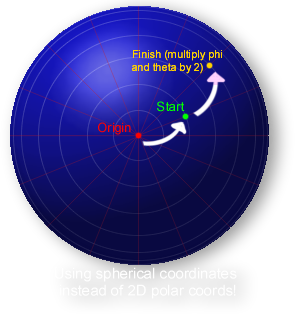 I went to great lengths to explore the concept, including the utilization of various spherical coordinate systems and adjusting the rotation of each point's 'orbit' after every half-turn of phi or theta. But it didn't work. Something was missing. I scoured everywhere to find signs of the 3D beast, but nothing turned up. 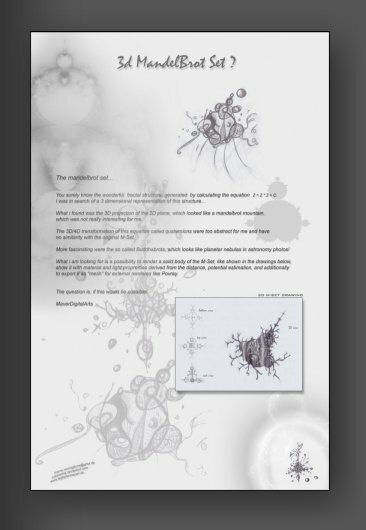 On October 13th, 2006, Marco Vernaglione put out the question and challenge to the world with this memorable document. 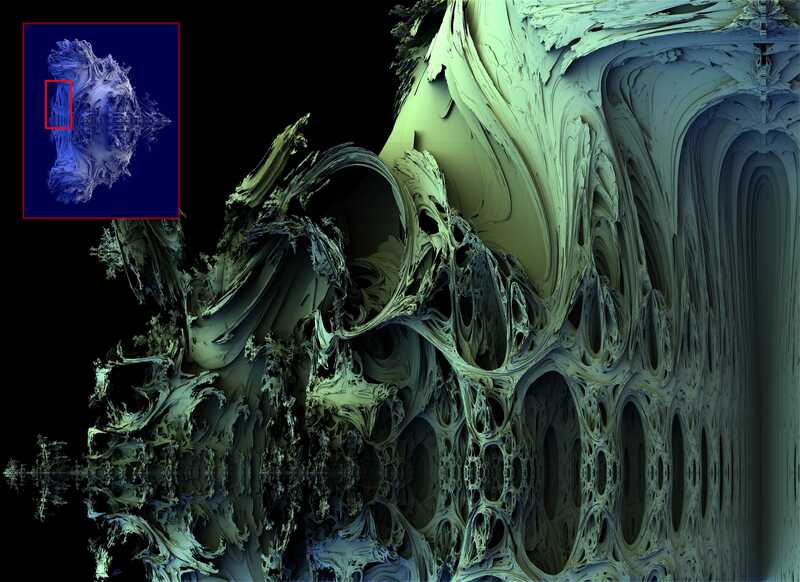 Pretty 3D fractals were everywhere, but nothing quite as organic and rich as the original 2D Mandelbrot. The closest turned out to be Dr. Kazushi Ahara and Dr. Yoshiaki's excellent Quasi-fuchsian fractal (see right), but it turned out that even that doesn't have the variety of the Mandelbrot after zooming in. 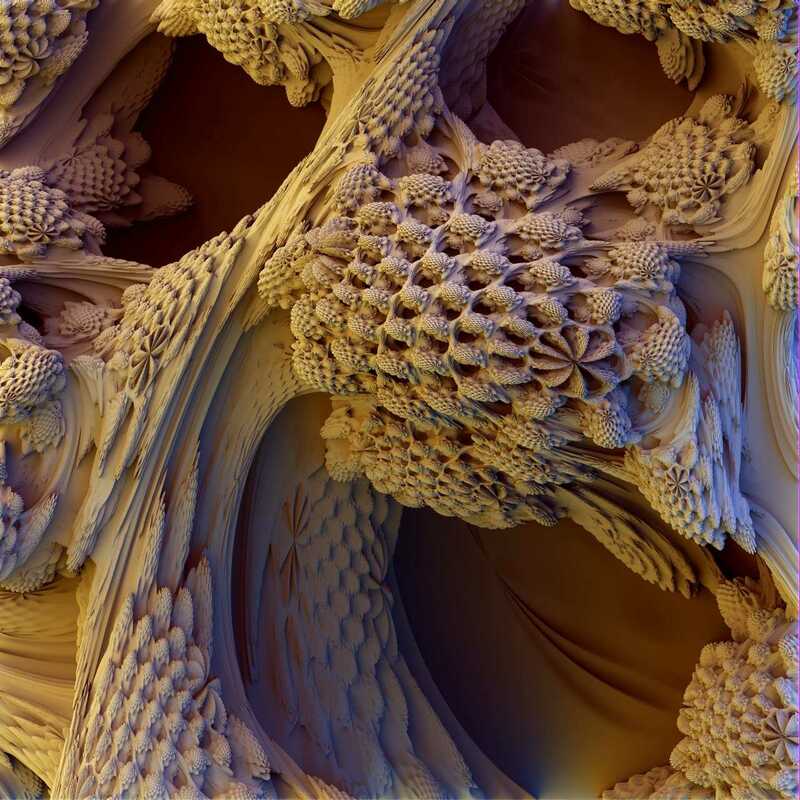 Some said it couldn't be done - that there wasn't a true analogue to a complex field in three dimensions (which is true), and so there could be no 3D Mandelbulb. 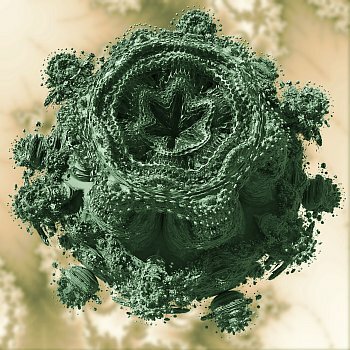 But does the essence of the 2D Mandelbrot purely rely on this complex field, or is there something else more fundamental to its form? Eventually, I also started to think that this was turning out to be a Loch Ness hunt. 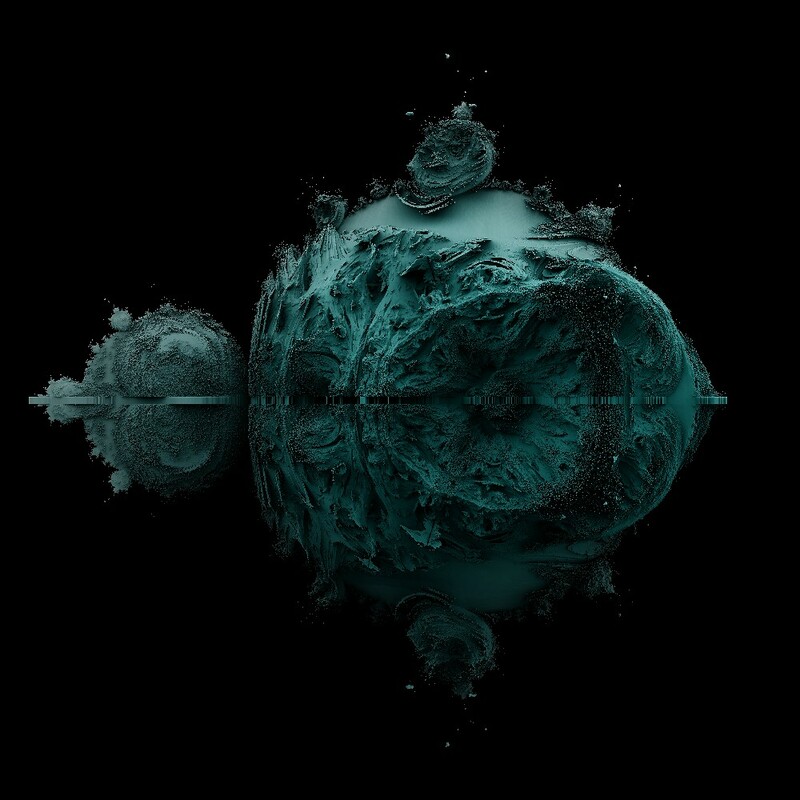 But there was still something at the back of my mind saying if this detail can be found by (essentially) going round and across a circle for the standard 2D Mandelbrot, why can't the same thing be done for a sphere to make a 3D version? Our story continues with mathematician - Paul Nylander. 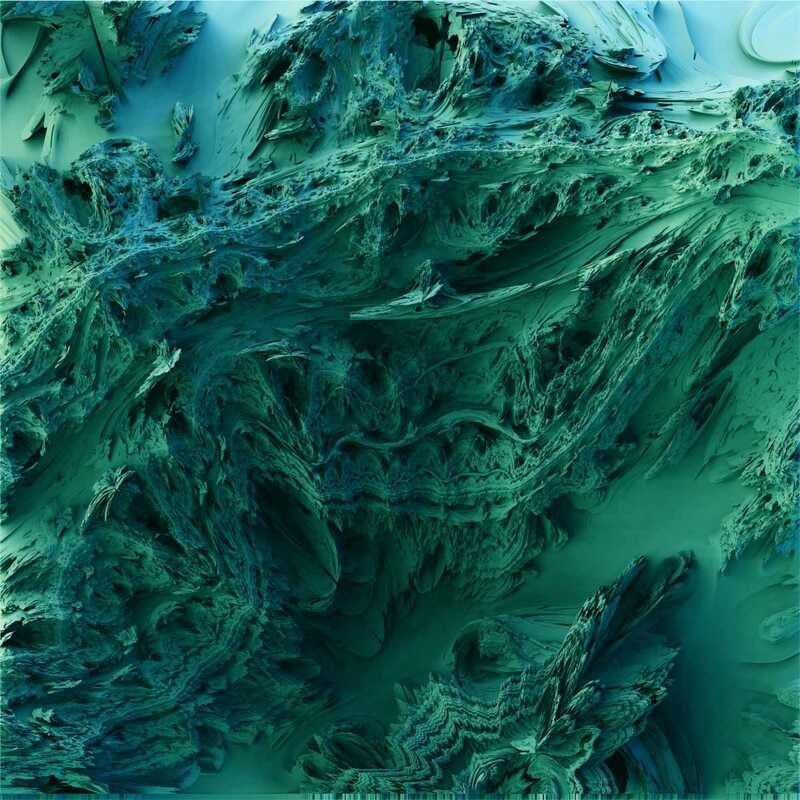 His idea was to adjust the squaring part of the formula to a higher power, as is sometimes done with the 2D Mandelbrot to produce snowflake type results. Surely this can't work? After all, we'd expect to find sumptuous detail in the standard power 2 (square or quadratic) form, and if it's not really there, then why should higher powers work? Okay... now this is starting to look interesting. We're already starting to see buds growing on buds. 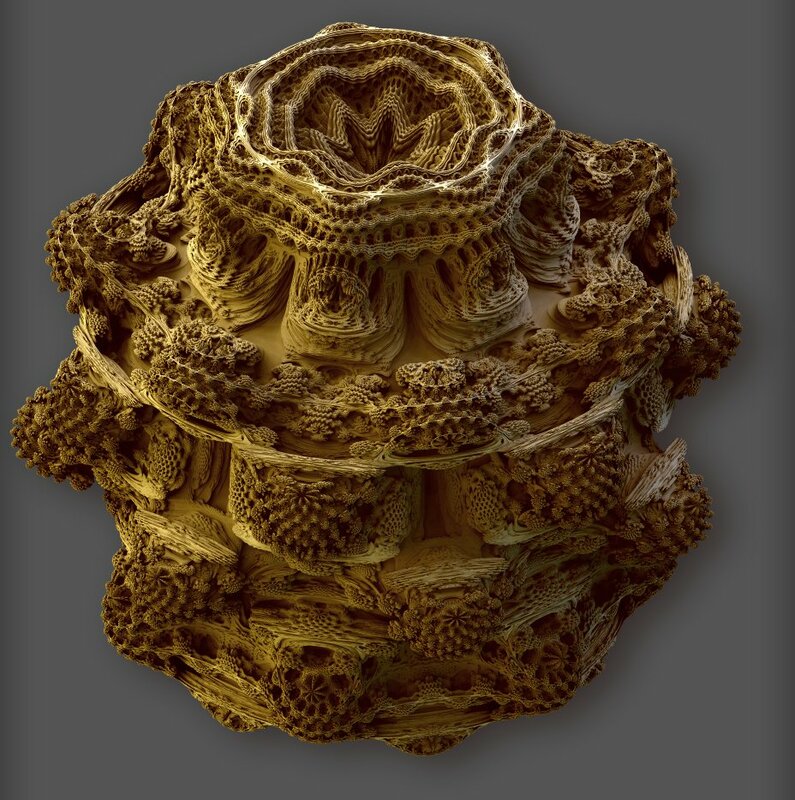 Could.... this... object still hold any fractal detail if we zoomed in far enough?! More of Paul's work can be found here. WOW! Okay, now we're talking. 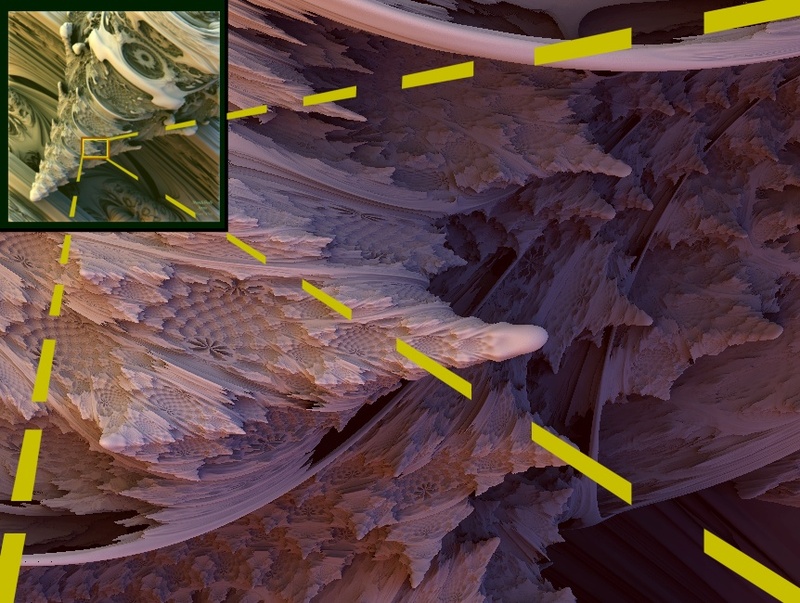 These are deep zoom levels (the first being over 1000x), but fractal details remain abundant in all three dimensions! The buds are growing smaller buds, and at least to the picture on right, there seems to be a great amount of variety too. We're seeing 'branches' with large buds growing around the branch in at least four directions. These in turn contain smaller buds, which themselves contain yet further tiny buds. 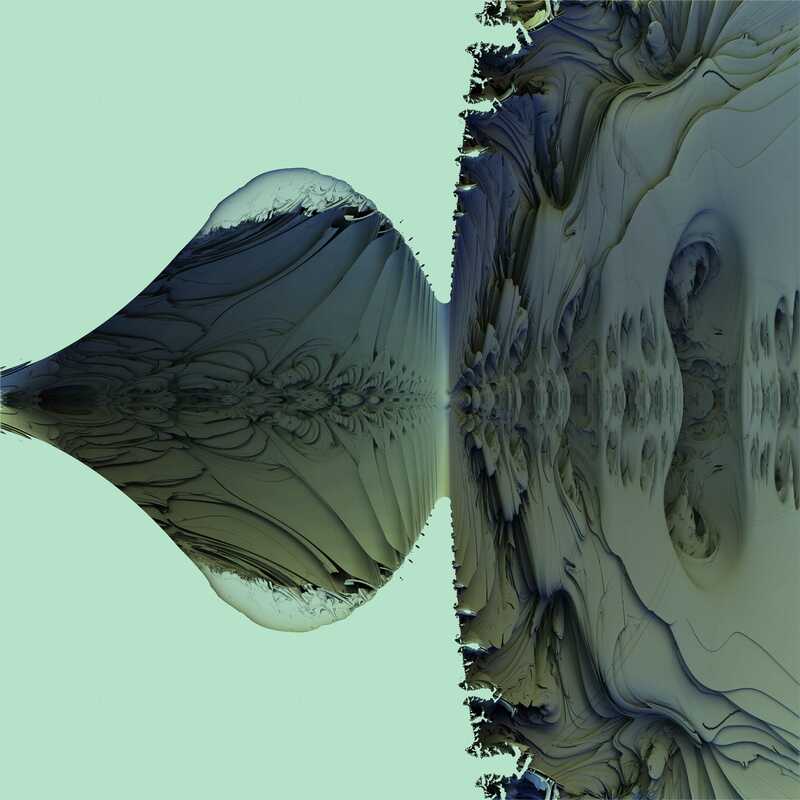 Remember, these pictures are not created from an iterated function system (IFS), but from a purely simple Mandelbrot-esque function! 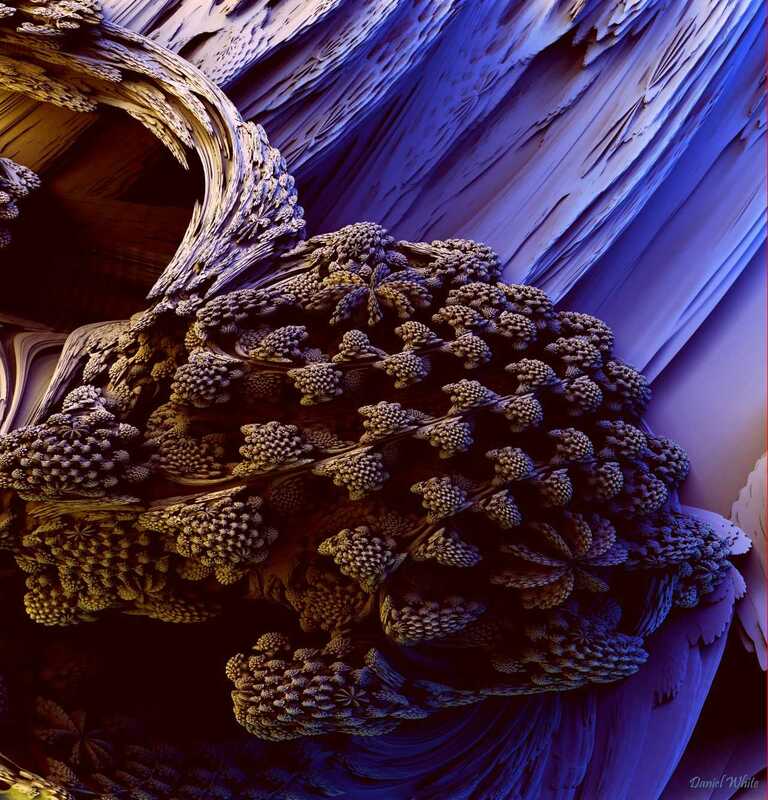 Even the picture on the left is interesting, and is reminiscent of the Romanesco broccoli vegetable. But glance at the top right of the left picture - there also seems to be a leaf section in the shape of a seven sided star. 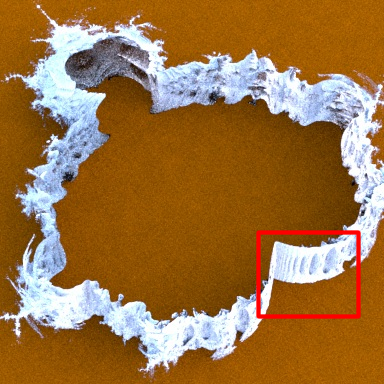 Does this hint at a deeper variety in the object than we can possibly imagine? What the heck have we stumbled upon here? 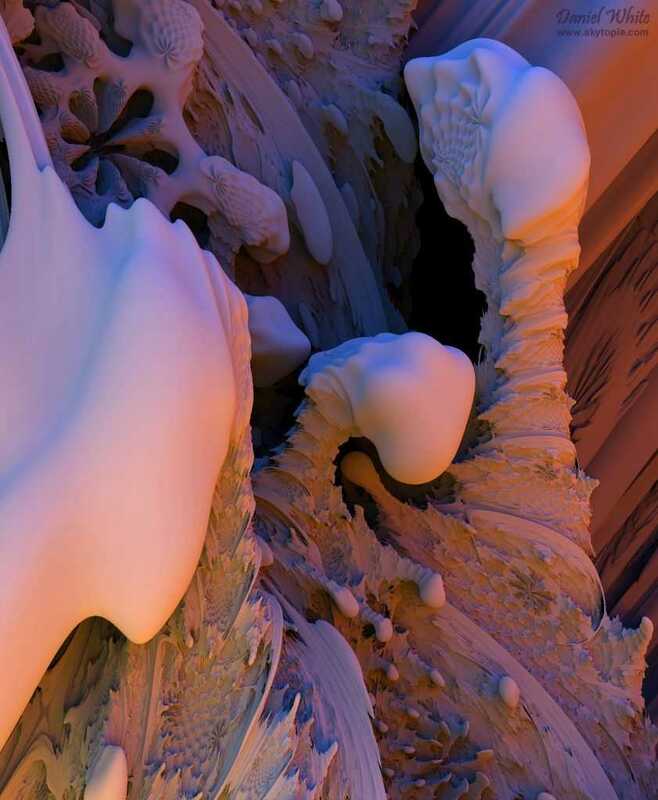 Because of the lack of shadows, it's difficult for the renderings to give justice to the detail, but what we have here is a first look into a great unknown. 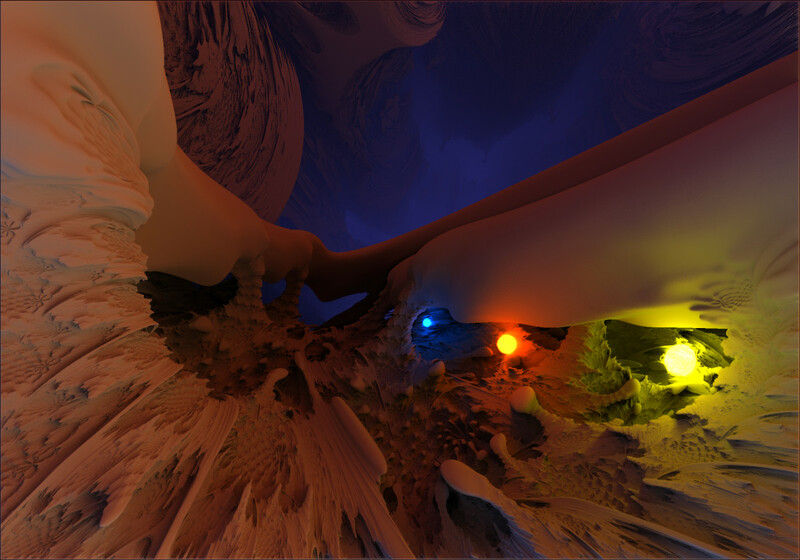 Eager to get a better look at this thing, I set about trying to find software to render it, preferably with full shadowing and even global illumination, and at least something that was fairly nippy. 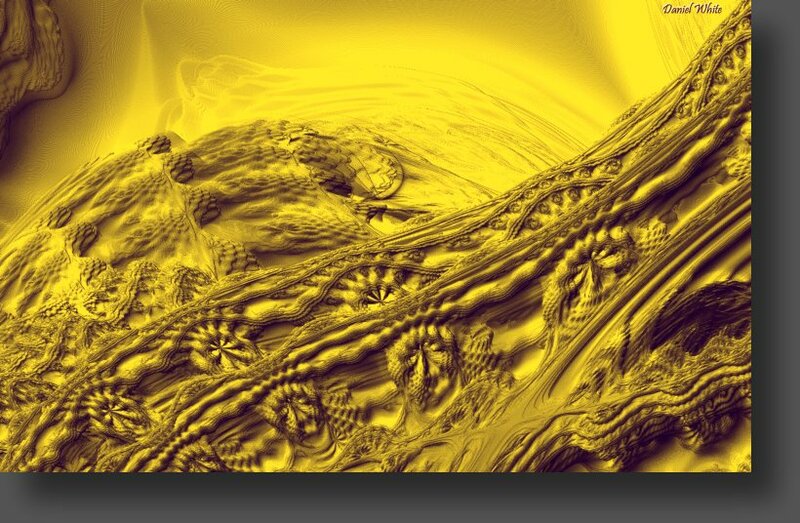 But it turns out that there are probably no 3D programs out there on the market that can render arbitrary functions, at least not with while loops and local variables (a prerequisite for anything Mandelbrot-esque!). 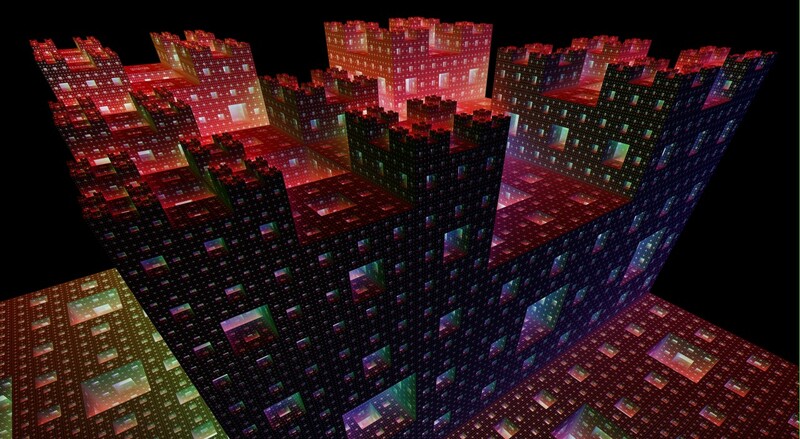 So I set out to create my own specialized voxel-ish raytracer. 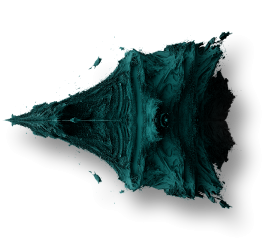 Results could be slow (perhaps a week for 4000x4000 pixel renders! ), but it'll be worth it right? But it wasn't until I incorporated proper shadowing that the subtleties of this incredible object became apparent. For the renders below and exploration afterwards, I'll be concentrating mostly on the 8th power, since that seems to be around the 'sweet spot' for overall detail and beauty, but lower powers can also produce stunning results too. 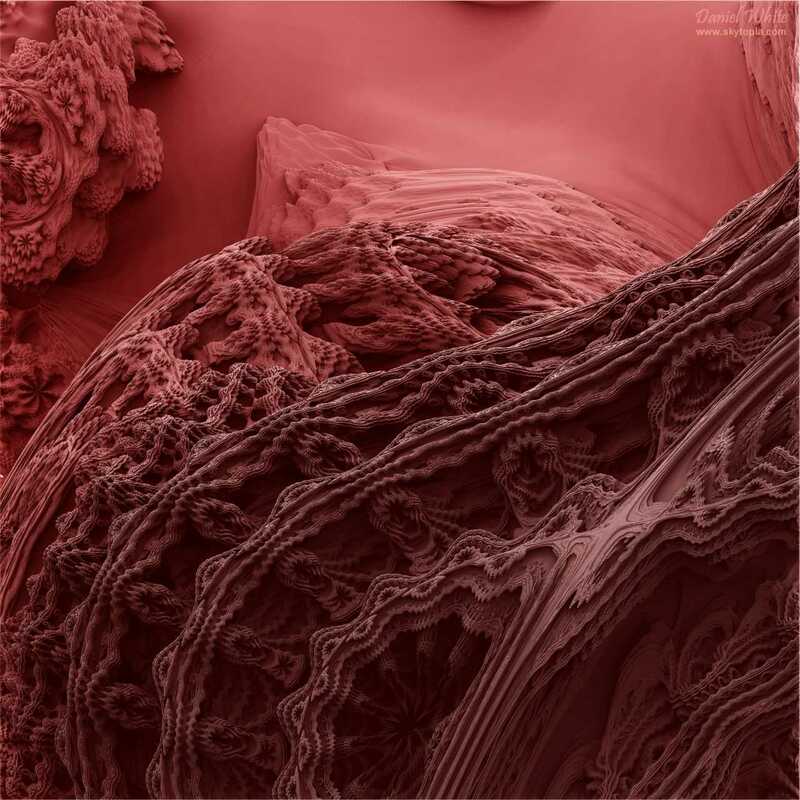 "Mandelbrot Crust" You don't have to zoom in far before you get to see this. "Cave of Lost Secrets" This ancient half mile high cave still exists (now underwater) from a planet several billions of light years away from Earth. 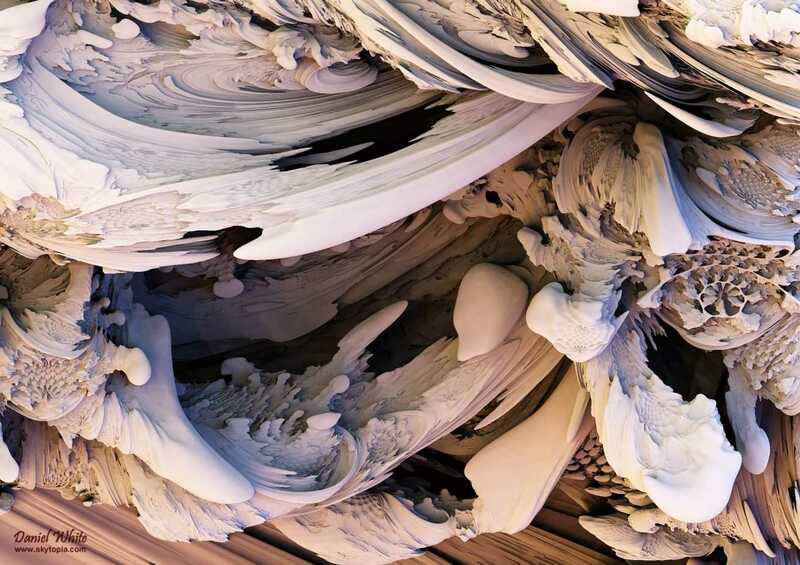 It was built by a (now extinct) intelligent race of beings who also discovered the 3D Mandelbulb we are witnessing on this page. Inside the cave however, lies - amongst other technological and mathematical secrets - the last remaining scroll which contains the much deeper secret of the even more incredible real 3D Mandelbrot formula (giant structures of that were also built at a later stage, but were apparently destroyed for reasons unknown). "Magic Broccoli" Mini-Bulbs from the set don't just sprout uniform smaller bulbs, but rather twist and shear to create surprisingly strange patterns. 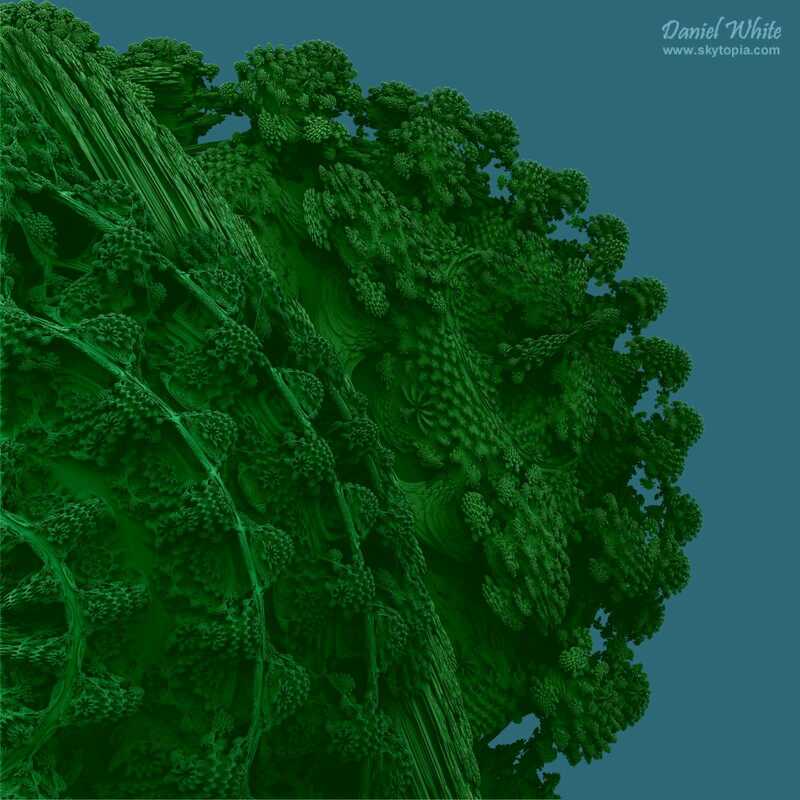 This reminds me of Romanesco Brocolli. 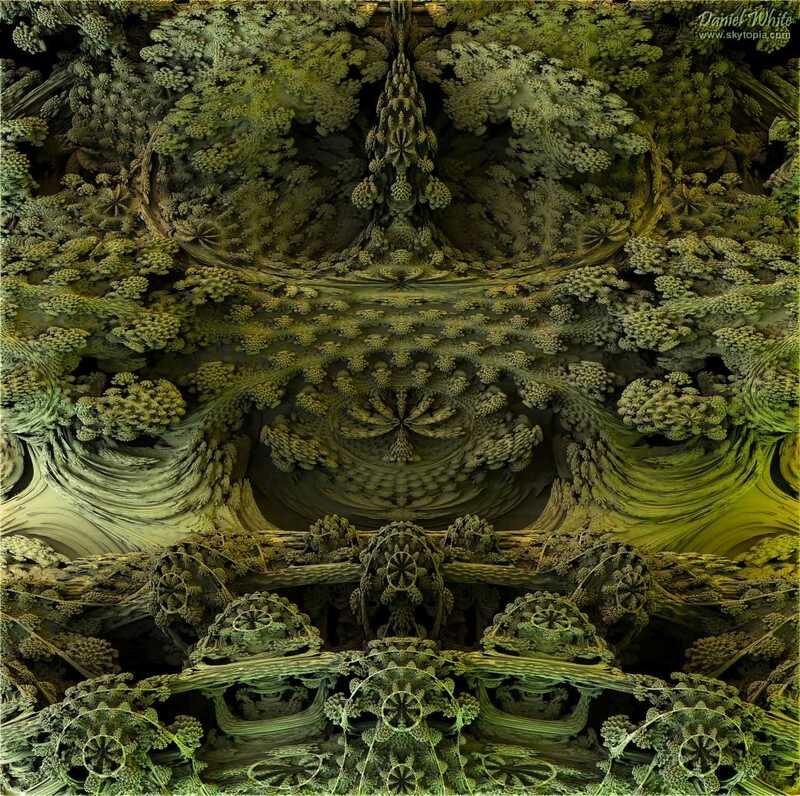 "Mandelbulb Garden" Zooming in yet further to the left, we visit the Bulb's horticultural centre, and still, we see no sign of detail degradation. [below] Zooming out again, we see some of the main support structures holding up the giant 40 mile wide Colosseum at the top right of the picture. Seriously, this universe has got to be quite messed up to be harbouring math secrets capable of this kind of Baroquian beauty. 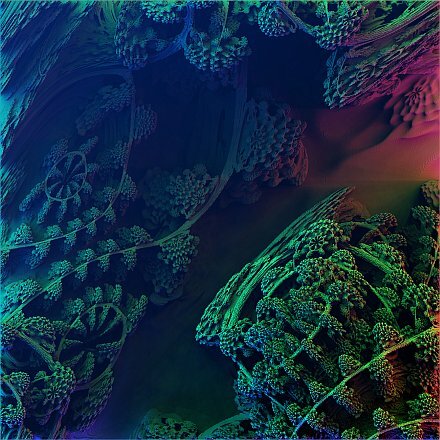 "Christmas Coral Egg" Red, green and blue lighting combine to create all the other colours in this chrimbo themed fractal. 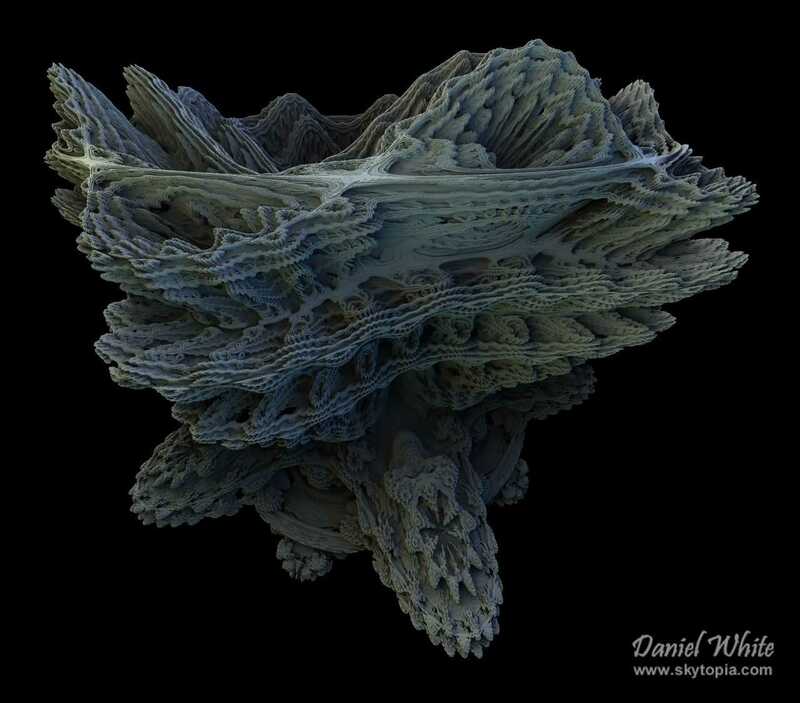 "Christmas Coral Reef" - A deep zoom into the picture on the left. "Honeycomb Heaven" It's easy to think of a bee hive when seeing this. Little did I know at the time about the honeycomb pattern below the hive. "Mandel NightShade" Rumour has it that one sniff of this plant and you're turned to dust. A little more deadly than usual then. 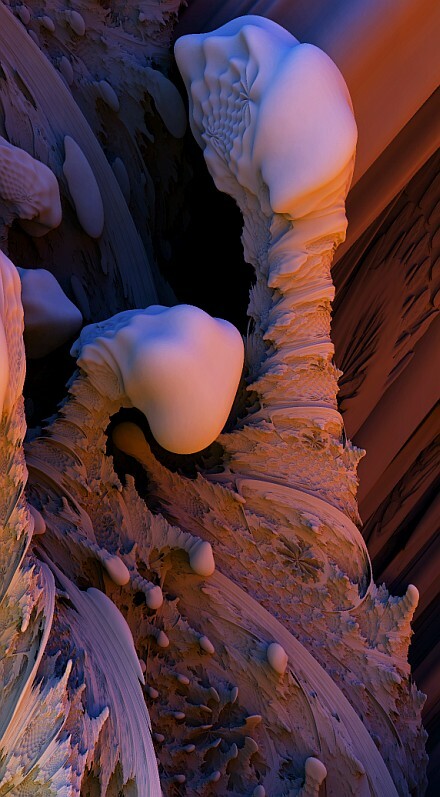 "Mandelbulb Spine" The inside is just as amazing as the out, as this zoom shows. 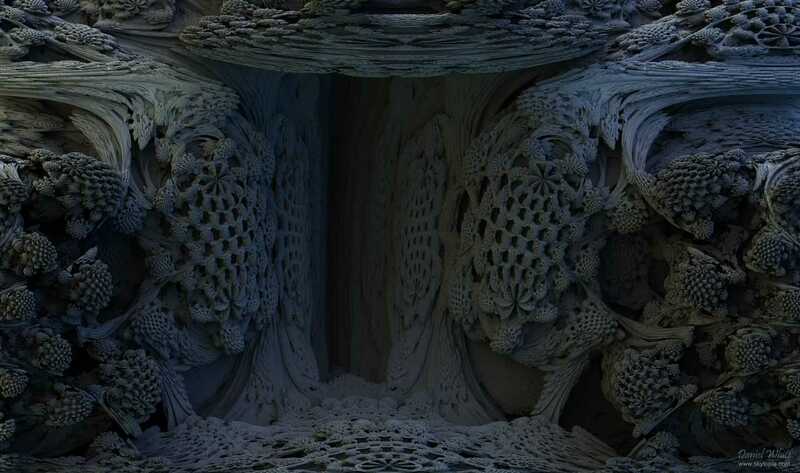 (this shot shows the detail of the original 7000x7000 render). "Ice Cream From Neptune" What, Neptune* from our solar system? Neah, we're talking about a planet unique in all but the name, near the distant edge of the universe. They have advanced food making equipment, and an eye for detail, so they regularly consume attractive cornetto-esque dishes, sometimes in the shape you see above. * Yes we renamed it. We mistakingly used the planet's old name that was in use until around 50,000 years ago. By another massive but convenient coincidence, they themselves renamed it for similar reasons to Professor Farnsworth's story from Futurama. 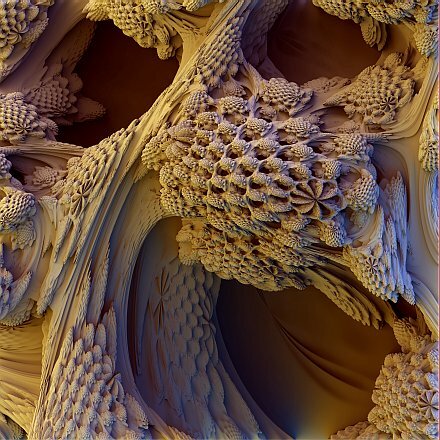 "Caramelized Hazelnut Swirl" Objects take on a completely different character inside the 3D Mandelbulb, as these surrounding pictures testify. 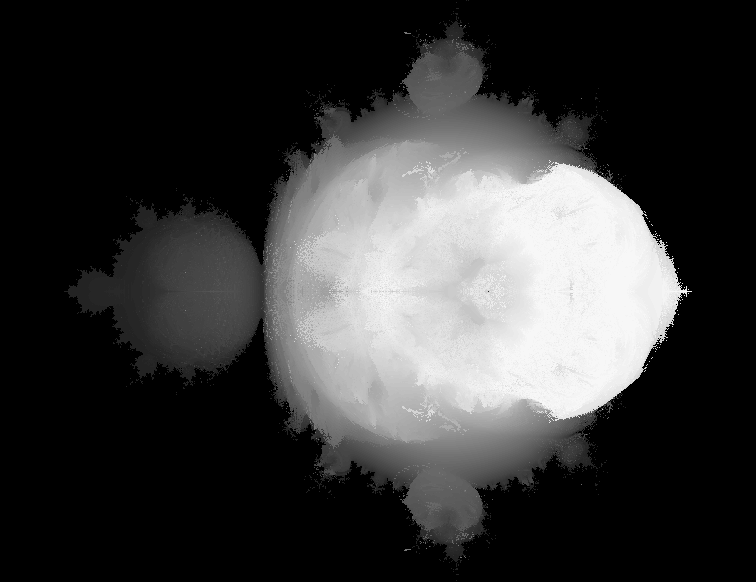 "Hell Just Froze Over" 5 minutes ago, possibly because someone found the definitely-really-true-and-we-mean-it-this-time-3D .... Mandelbrot. "Greenbulb Canyon" (NEW). This one again is on the outside and in perspective. Someone in this picture if you look closely. This picture is available at Franklins Art Gallery. "Fossil Valley" (NEW). 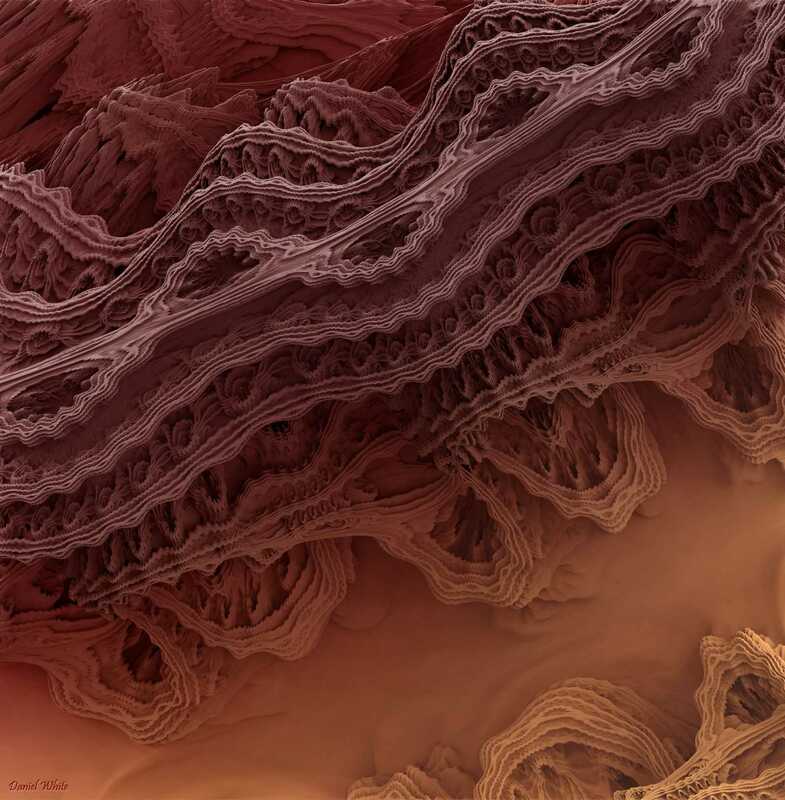 This is a deep zoom into the Mandelbulb Spine. See here for more details. And here is the beast itself (power 8 version). All of the above images come from this object below (giant 4500x4500 pixel version available here). It's not just myself of course who's rendered stunning shots of the Bulb. 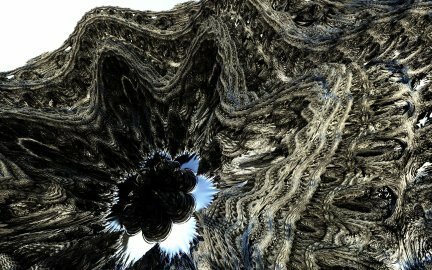 The guys have over at Fractal Forums have also rendered mouth watering pictures and animations, some of which I'll show below. It's a real honour to present them on this page - please visit their websites to view more of their creations. 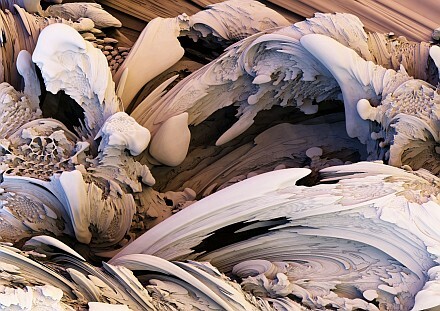 This jaw dropping image created by Krzysztof Marczak uses many iterations to achieve a more fragmented surface texture. View full size, and you'll notice countless 'satellites' around other bigger satellites. 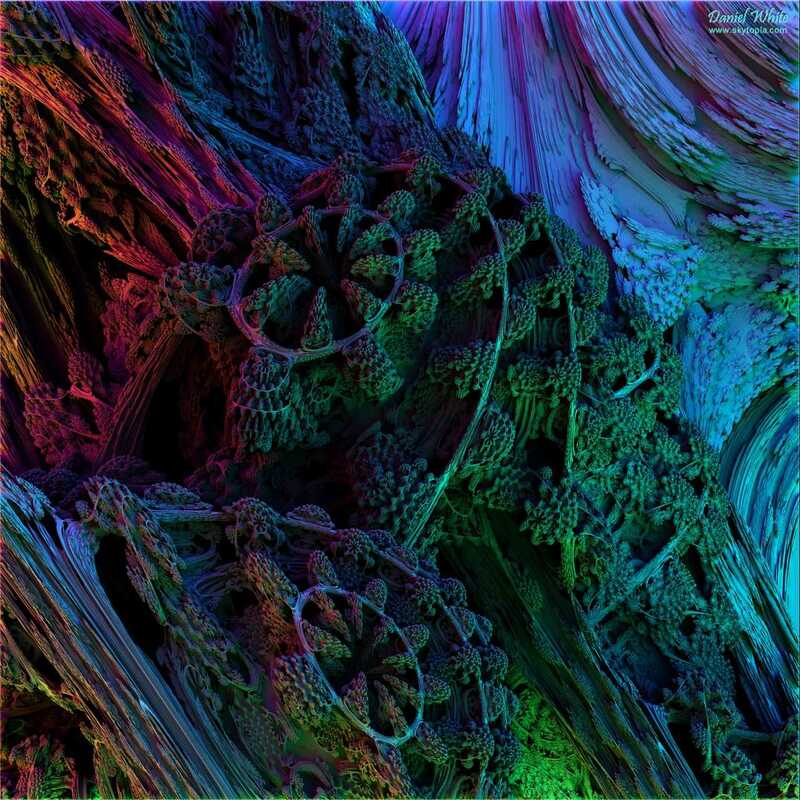 "The Honeycomb": The fantastic material combined with the different colour ranges give a real sense of depth in this picture created by David Makin. "Siebenfach": The unusual material and ornate rope-like detail evokes a more mysterious atmosphere in this stunning render from Thomas Ludwig. Full resolution available from here. Gotta love the luminous sorbet style texture of the quadratic version of the Mandelbulb, created by Paul Nylander. See his Hypercomplex Fractals page for a bigger view. "Asteroid National Park" - This degree 4 behemoth would have certainly made an interesting replacement for the asteroids used in "Armageddon" and "Deep Impact". Excellent render by David Makin; view full res to see it in all its glory. 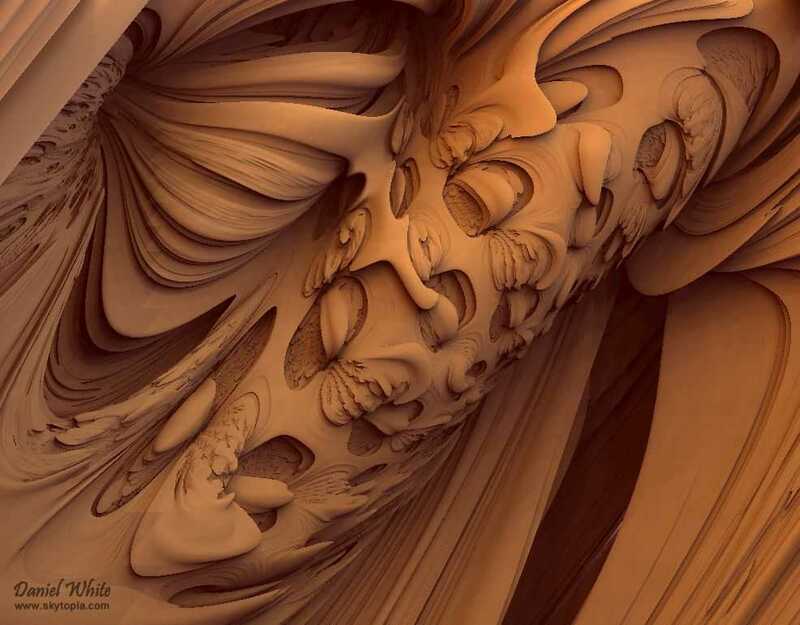 Created by Garth Thornton, a special variant of the Julia formula is used in combination here to create this amazing fossilized design. See the thread here for further interesting variations. Are gorgeous flyovers and parallax zooms now possible? But of course. This one from Youtube to the right is one such rendering (Youtube decreases the quality and framerate a lot, so email me for the original). Watch this space for future animations. 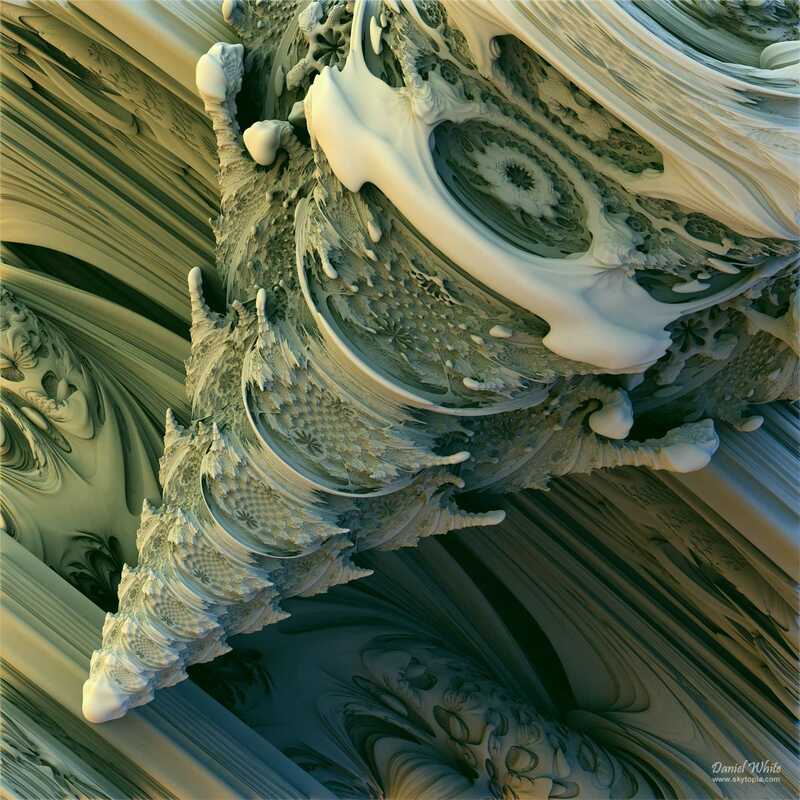 Also, if you want to make any yourself, and would like them to featured on this page, let me know, or even better, post it to FractalForums.com. 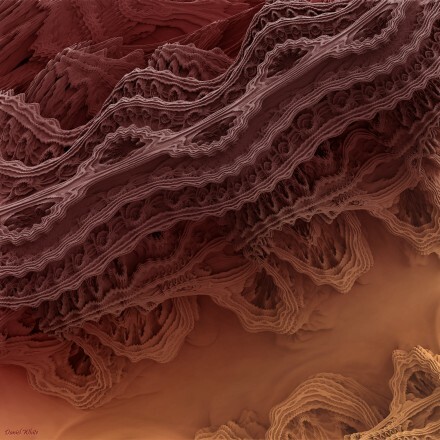 Also check out bib993's video (especially this one), I�igo Qu�lez's video, and Softology's video, David Makin's animations, such as the degree 4 version of the Mandelbulb, his Crater Lake Flyover, Krzysztof Marczak's excellent voyage and rotational Mandelbulb variation, William Rood's Mandelbulb section on his website, other videos, and this computer generated romanesco broccoli created by Aleksandar Rodic (which is an IFS type fractal rather than the Mandelbulb we're exploring, but still really cool). Keep an eye out for the latest news and renders on this page, and over in the 3D Mandelbrot thread over at Fractal Forums. As of 05/11/2009, the pictures here in this article are only a preliminary look into the thing. The best stuff is surely yet to come! 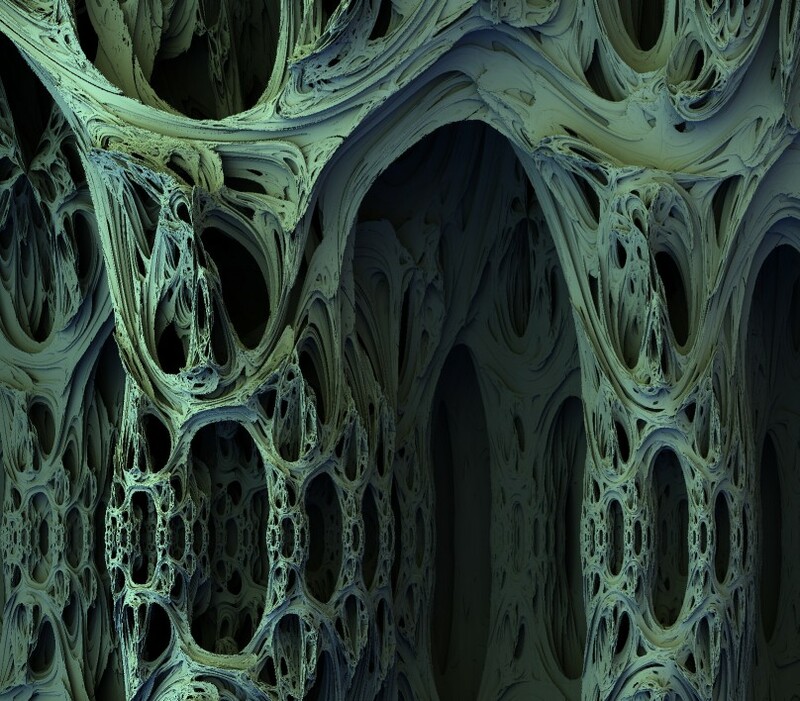 UPDATE: Fractal Forums has been buzzing with activity since the find. 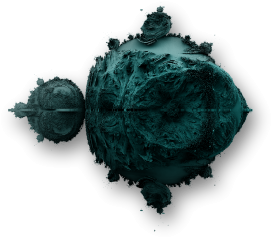 Check out for instance the incredible Mandelbox - a 3D fractal discovered by Tom Lowe with a more 'mechanized' look to it. Also see some of the videos floating around (e.g. see this from Krzysztof! 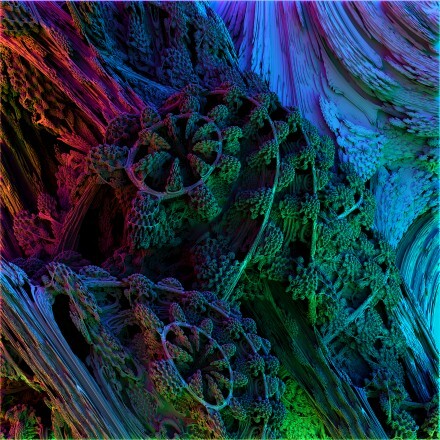 ), this intriguing comparison from Miqel.com detailing similarities with traditional fractals, and some of the latest findings. Last but not least, also see some of the incredible new works which are appearing at deviantART.